As soon as I had seen the trailer for this film I knew that it was one that I wanted to see. For one thing, I am a fan of Michael Cera and so I’m willing to see anything that he’s in. 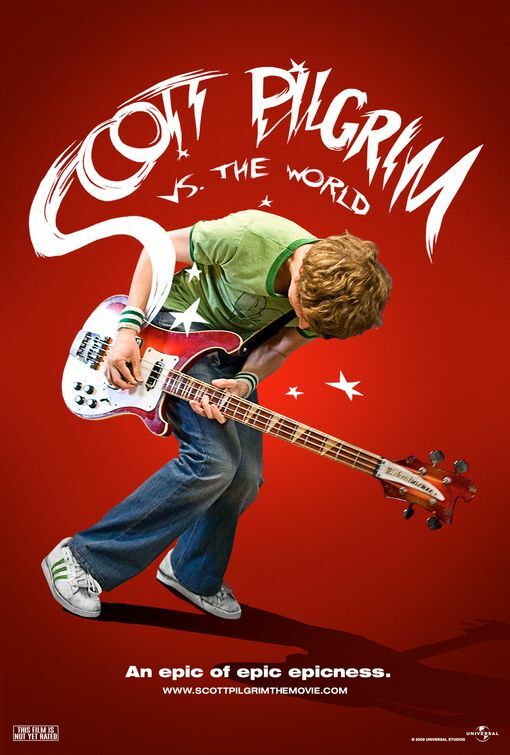 The plot consisted of a very video game style theme; Scott Pilgrim (Cera) must defeat the girl of his dreams’ seven evil ex’s. In this sense, each evil ex is essentially a video game level and the more he defeats, the harder they become to kill. Now everyone knows that Cera usually plays the pathetic nerdy boy who somehow manages to get the girl that he wants without really doing anything other than smiling and being very sensitive. However, in this film, despite his nerdy appearance, he is the bass guitarist in a rock band, manages to have lots of girlfriends and has amazing strength. Now I know that the special effects have been exaggerated in this film; the producers seem to have thought, “Screw this let’s have some fun!” This works fantastically as the film is intended to resemble that of a graphic novel (as the original story was) and they use all the onomatopoeic words such as ‘kapow!’ and ‘bam!’ and the film also features the characters’ thoughts written down if the audience needs to know what they are thinking. The fight scenes are brilliant and I found them really entertaining, despite my lack of interest in action films. The scenes contained a ‘magical’ element to them and each one was significantly different. It was also entertaining in the fact that I was never sure whether Scott would actually win the fight or not because he is still a weak, nerdy boy when it comes to it. I didn’t find myself bored when watching the film at all, however, I thought that one of the characters was quite annoying. Another point is that I thought that some of the characters’ actions were quite unrealistic. I know that the film is full of exaggerations, but I think it would have been interesting for the characters to act as people normally would react to situations. If you want to see a feel-good film, this is ideal. If you’re more for an action film, go see this. Or if you want a good laugh, you should see this film.